the public art fund has announced that in may 2017, anish kapoor will bring ‘descension’ — a continuously spiraling funnel of dark water — to brooklyn, new york. sited at pier 1 in brooklyn bridge park, the 26-foot diameter installation will create a striking juxtaposition to the adjacent east river, continuing kapoor’s long-standing interest in the destabilization of the physical world. 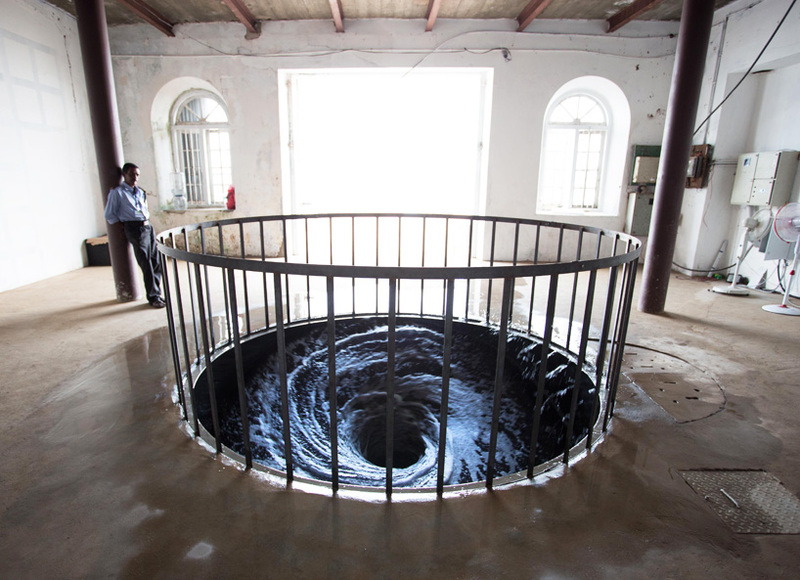 the spiraling whirlpool is treated with an all-natural black dye, creating a seemingly endless hole, into which visitors are invited to carefully peer. the presentation of ‘descension’ in brooklyn follows its first display as a smaller, interior work at india’s kochi-muziris biennale, following which it travelled to galleria continua in san gimignano, and later to a solo exhibition at versailles. this latest commission by the public art fund, curated by public art fund director nicholas baume, marks the first time kapoor brings ‘descension’ to north america. Vortex as a good metaphore of contemporary dark forces with their seat in New York… First time Kapoor doesn’t do kitsch.